Adapted from the article “Planting a successful annual reseeding cover crop” by Janine Hasey, UCCE Farm Advisor, Sutter, Yuba, Colusa Counties and Mark Cady, Community Alliance with Family Farmers in the August 2008 Sacramento Valley Walnut News. Updated October 2018. Three cover crop systems used in walnut orchards are winter green manure crops that are mowed or cultivated in spring, annual reseeding legumes or grasses, or perennial sods. This article focuses on annual reseeding cover crops although the planting guidelines are similar for successfully establishing any seeded cover crop. Annual reseeding cover crops are planted initially in the fall and managed during the spring and early summer to allow plants to naturally reseed. They can only be maintained in non-cultivated orchards. Once seed has fully matured in early to mid-June, the annual reseeding cover crop is mowed. If managed properly, the cover crop will re-seed annually and re-establish the following fall and winter so costs incurred will be initial seed and planting costs only. 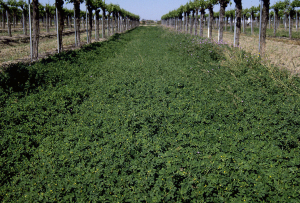 Why are annual reseeding cover crops so well suited to orchards in the Sacramento Valley? A primary advantage to an annual reseeding cover crop in high rainfall areas such as the Sacramento Valley is better fall and winter orchard access due to firmer ground. Early fall rains can make it very difficult to harvest in walnut orchards cultivated for weed control or incorporation of a winter green manure cover crop. Other advantages may include weed suppression, less runoff compared to bare soil, and reduced labor and diesel costs since the seeded cover crop is usually mowed only a couple of times in the spring and early summer. Planting a cover crop can improve soil quality by adding organic matter and for legumes, also nitrogen. Allowing resident vegetation to grow during the winter with mowing in the spring and summer has many of these same advantages but may have less biomass than a seeded cover crop. For any fall-seeded cover crop, the best results will be achieved with the earliest possible planting date. Any time in October to early November is suitable for planting a cover crop in the Sacramento Valley. By December, soil temperatures are too low to provide quick and consistent germination while competition from resident vegetation becomes more of a problem. A cover crop can be planted in fruit crops and young non-producing walnuts in October. In producing walnut orchards, plan to seed just after harvest but before significant leaf fall for best stand establishment. Make sure the seed and equipment are lined up before walnut harvest begins. Cover crops can be seeded with various planting equipment including a no-till drill, a standard grain drill or a broadcast seeder. No-till drills can be rented from seed suppliers or Resource Conservation Districts. Grain drills are standard equipment for most field crop growers. Broadcast seeders are less available, though a fertilizer spreader can be used with some difficulty. In a pinch or on very small acreage, a worker with a large belly grinder on the tailgate of a pickup truck will suffice. Small seeded legume mixes are typically seeded at a rate of 25 to 30 lbs per planted acre. The kind of ground preparation required depends on the seeding equipment. Whatever the method, you will want to have a flat, level surface that is ready for harvest without any further ground work. A no-till drill requires little or no ground preparation and will plant directly into most surfaces. A contact herbicide treatment (not a pre-emergent) applied at or before seeding will prevent weed competition. Both grain drill and broadcast seeders require a soft surface into which small cover crop seed can be placed. Work up the top two inches of soil with a harrow or disk until the surface condition is fairly fine. Plant the seed right away. Seed should be buried in just the top quarter- to half-inch of soil. A no-till or a standard grain drill can place seed fairly precisely. If you broadcast the seed onto soft ground, a single pass with a ring roller should move seed and soil around enough to cover the seed. Normal fall and winter rainfall will be sufficient for germination and winter growth. A light irrigation may be needed by late November if there hasn’t been sufficient rainfall for seed germination. Likewise, to ensure the cover crop’s continued growth, winter irrigation will be needed if there is insufficient rainfall. Common problems with cover crop seeding often involve poor timing. Early rain can stop you at any step of the seeding process. If rain falls after ground preparation but before seeding, weed seeds get a head start on the cover crop and the ground can seal up making it impossible to bury the seed with a roller or a standard grain drill. This is a good reason to have your seed and equipment lined up before walnut harvest is over. In 2007-08, we had several annual reseeding cover crop demonstration sites in tree crops. A subterranean clover mix with varying maturity times was preferred by most of the grower cooperators because it grew lower to the ground and didn’t interfere with other cultural practices, it could be mowed more often if needed without decreasing seed production, and it fixed atmospheric nitrogen. Another cover crop mix that performed well but grow much taller was a nitrogen fixing legume mix with several clovers including Persian clover. These lower growing legume mixes were preferred to those that included the grass soft chess (Blando brome) mainly due to the taller grass but also due to potential benefit of nitrogen fixation. The above-ground biomass accumulated ranged from just over 2,000 lbs/acre to well over 8,000 lbs/acre. This resulted in 31 to 250 lbs of nitrogen (N) per acre with an average of 92 lbs N per acre. Assuming a 50 percent N recovery rate, an average of 46 lbs N per acre would be available for tree uptake. The sites where the cover crop established well contained the higher amounts of biomass. Supplemental nitrogen may be needed in mature walnut orchards and should be applied as a broad band in the tree row rather than broadcast or clover seed production will decrease over time. For more information, see ANR Publication 21627, “Cover Crops for Walnut Orchards”.